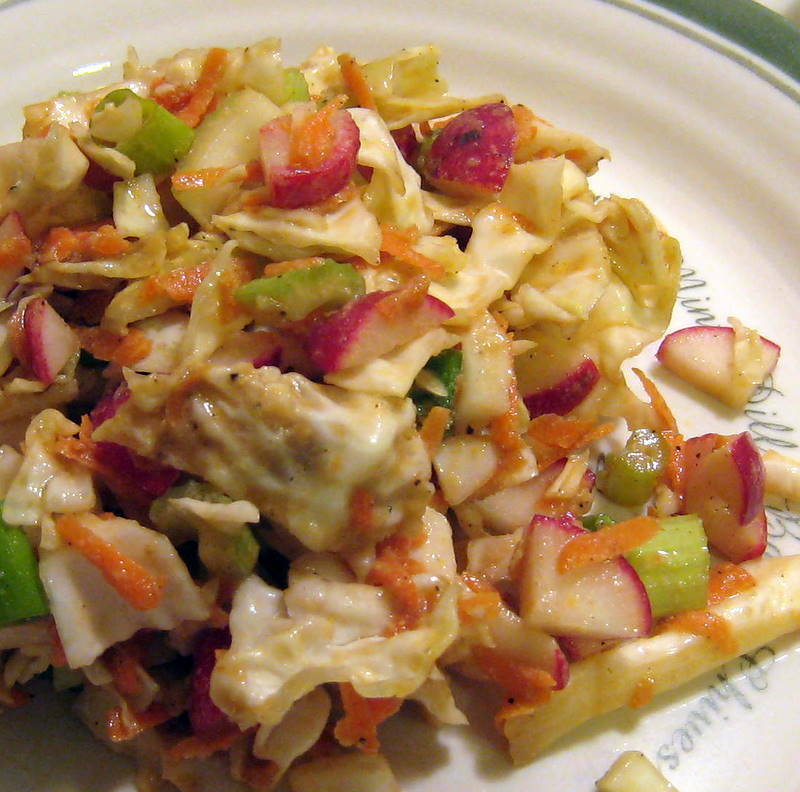 This recipe is an adaptation of a library school friend’s family recipe. It’s simple, cheap, and deliciously veganized. We used brown rice noodles to make it gluten-free, as well. L.B., if you’re out there, thanks! Saute onions until translucent, then add garlic and cook about 30 seconds. Be careful not to burn the garlic. Add tomatoes, spices, and nutritional yeast. Add chickpeas, then bring to a boil. Immediately, cover and reduce heat to low. Cook covered about 10 minutes. Cook pasta and drain. 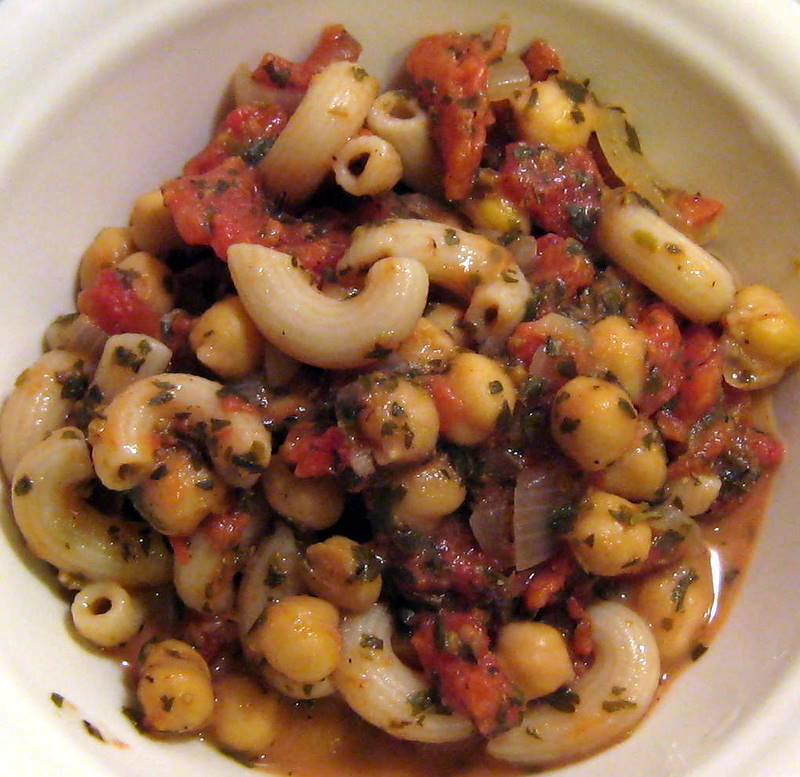 Add pasta to the chickpeas and cook covered an additonal 10-15 minutes. Mix together 1 tsp garlic powder, 2 TBL lemon juice, 1 TBL balsamic vinegar, 1 TBL olive oil, 3 TBL water, 1/4 tsp black salt, 5 TBL nutritional yeast. Mix together with the vegetables in a big bowl and chill for 20 minutes. This entry was posted in cabbage, chickpeas, noodles, nutritional yeast, tomatoes, vegan and tagged chickpeas, gluten free, pasta, slaw, tomatoes, vegan by Beans, Figs and Katz. Bookmark the permalink.